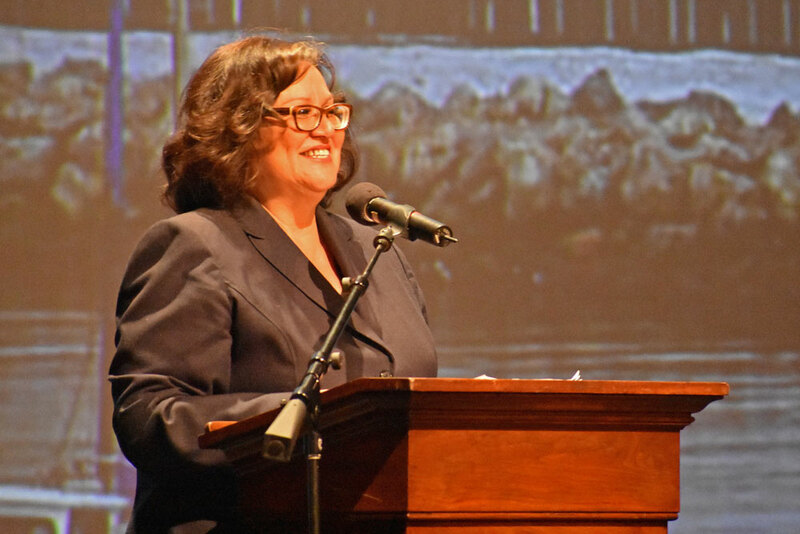 The future of storefront vacancies along Santa Barbara’s downtown State Street, desalination, environmental stewardship, economic vitality, the art scene and the post-disaster phase were topics discussed Thursday at Mayor Cathy Murillo’s first State of the City address. The city has numerous initiatives in response to downtown concerns, such as installing new wayfinding signage and upgrading electrical infrastructure across town; adopting smoke-free outdoor public area rules; and altering Santa Barbara’s alcohol policy. Twenty-seven spaces sit empty along State Street, Murillo said. The city launched a new ACCELERATE program with a goal to make it quicker and easier to occupy commercial space in the downtown to help revitalize economic development for State Street businesses located between Cabrillo Boulevard and Sola Street. ACCELERATE projects receive priority building plan review for tenant improvements, and applicants receive priority on the city’s Sign Committee and Historic Landmarks Commission agendas. There’s also good news for Santa Barbara's main commercial corridor, she said. The Saks Fifth Avenue OFF 5TH building has been purchased by Michael Rosenfeld, the founder and developer of Hotel California along the waterfront, Murillo said. “The Saks lease has been extended a year, preventing another large vacancy on State Street,” she told attendees. Preliminary discussions are underway for a mixed-use housing project at the two-story, 1001 State St. location on the Chapala and State streets intersection, according to Murillo. The project is the work of the team behind a new mixed-use development proposed for the corner of Anacapa and Ortega streets. Murillo noted that Arlington Plaza, adjacent to The Arlington Theatre on Chapala Street, will “soon” be complete, with 33 units of rental housing. “With all of the projects moving forward, we hope the large-scale investments will breath fresh life into downtown,” she said. Target's new Santa Barbara store inside the Galleria building at 3891 State St. on the southwest corner of La Cumbre Road is a “sign that we are entering a new chapter in the retail world… Target selected a much smaller space than their traditional stores,” Murillo said. The store concept provides a “customized selection of items” and purchasers buying online can pick up in store, she said. Murillo said Pacific Retail Capital Partners, the operators of Paseo Nuevo Shops & Restaurants, acquired Santa Barbara's former Macy's building at 701 State St.
“They are welcoming new retail and mixed-use concept for this downtown site,” Murillo said. Plans are in the works to enhance Paseo Nuevo Shops & Restaurants with new landscaping, kid-friendly features and lighting in dimly lit places. The mayor discussed several upcoming projects, such as installing more public art, including at the Highway 101 underpass at Lower State Street that connects Santa Barbara's waterfront and lower State Street, as well as bike and pedestrian improvements in town. Murillo spoke of some “significant issues” the new City Council has dealt with since January’s swearing-in ceremony — from cannabis business permitting and housing policy recommendations to the aftermath of being hit with disasters that have taken a toll on families, the local economy, homes and businesses. Murillo began her speech by applauding first responders, city public works employees, Caltrans and the U.S. Army Corps of Engineers for their efforts during December’s Thomas Fire and Montecito’s debris flows in January. She noted community members who went above and beyond to help others, including volunteers with the Santa Barbara Bucket Brigade who help clear debris and mud from Montecito homes, professional counseling services, the hotels that welcomed evacuees, the restaurants offering free meals to those affected, and area schools opening their campus to help displaced students. In a brief video played to attendees, a handful of individuals, businesses and nonprofits were recognized, including the Santa Barbara business MacMechanic, which provided computer repair operations to Montecito debris flow victims to help recover the data, and those who assembled to purchase at local businesses during a Cash Mob on Coast Village Road in Montecito. “The video is only a glimpse of the outpouring of generosity,” Murillo said. Santa Barbara's 50th mayor discussed the community's vulnerability to natural disasters, the importance of disaster preparedness and the effects of climate change, and said fire season is year-round. The ongoing drought condition, Murillo said, is a slow, unfolding emergency incident. The operation of the Santa Barbara’s desalination plant is providing a “critical” role while using state-of-the-art technology and design practices to reduce electrical demand and environmental impacts, she said. Santa Barbara will have a “sufficient” supply of water through 2019, with the help of State Water and purchased water, in addition to the desalination plant, according to Murillo. Water has also been conserved through "water-wise" landscaping. “We are in this together,” she said. Murillo spoke about energy conservation, which is a way the city is becoming more resilient in taking action to protect the natural environment. The city made a commitment to using 100 percent renewable energy for its community electricity supply by 2030. Streetlights are one of the city's largest single users of energy, and a number of citywide neighborhoods have received new LED fixtures to be as energy efficient as possible, Murillo said. The new fixtures provide improved security and light quality. Through energy retrofits and innovative renewable projects, the city is saving $550,000 annually on its electric bill, according to Murillo. In addition to environmental stewardship, a high priority for the city and other business organizations is improving Santa Barbara’s economic vitality. Strong economic development is a long-term goal, and a short-term goal is helping the region recover from businesses affected by the recent wildfire and debris flow. “These incidents have created more opportunity for us to partner with one another to improve our economic climate,” Murillo said. Murillo noted how Visit California reports that Santa Barbara County lost an estimated $1 million a day due to the nearly two-week closure of Highway 101. Attendees watched a video outlining how community partners and Visit Santa Barbara — the marketing organization for the city — continue brainstorming to develop and maintain marketing programs that keep the city top-of-mind as a travel destination for tourist, which is one of Santa Barbara’s leading economic force. “We must be creative in sending a message that Santa Barbara is open for business, with clear skies and the natural beauty that defines us,” she said. The mayor discussed the city’s cultural art — such as the Film Festival, emerging art groups like PuppetPalooza, and leasing city property at no cost to the Community Arts Workshop. The city provided more than $8 million to renovate performing art theaters to draw individuals to the downtown corridor for events, she said. It also contributes more than $700,000 annually to art organizations to ensure events and festivals take place, Murillo said. Murillo announced that new sculptures are expected to be installed in April on selected corners of State Street. “Investing in art not only spurs ticket sales, but also translates to additional dining and shopping, and even overnight hotel stays,” she said. Homeless issues and crime were also mentioned. In a video message played to the crowd, the community service liaisons that wear yellow shirts were highlighted for their work of patrolling State Street to enforce low-level violations, address nuisance behavior, some service-resistant transients, and issuing citations. Restorative policing officers work directly with the homeless population to assist with services. The presence of public safety groups in the downtown area has improved response to maintenance and nuisance issues, the video said. Over the last four years, the restorative policing team helped reunify 562 clients with friends or family, or placed the individuals in housing or support services, Murillo said. She said the Central Coast Collaborative on Homelessness launched a new initiative called Home for Good that's underway in the county to help individuals and families into permanent housing and linking them to the support they need. — Noozhawk staff writer Brooke Holland can be reached at bholland@noozhawk.com.